The Ace Bayou X Rocker II gaming floor chair offers style, comfort, and excellent speakers for a reasonable price, though taller people may not find it comfortable. Ace Bayou’s X Rocker II gaming floor chair with built-in speakers packs half of a home theater into one, sleek, compact package. Solid speakers and a sturdy construction underlie its stylish design, though some of its wired connections keep one foot rooted firmly in the past and the design may not be optimal for taller users. In all, however, it provides solid value for all of its utility. We spent over a week with the chair in our apartment to evaluate ease of setup, design appeal, and overall comfort, to judge if it deserves a place in your home theater or gaming setup. The X Rocker II is immediately inviting, with plush foam upholstery and an elegant overall aesthetic. The black vinyl covering has the appearance of leather, and along with the silver accents of the arms and rocker, they give the chair a classy, understated look that resists some of the more garish tendencies in gamer-targeted products. Even after a week of use, the stitching is tight and the overall build quality feels sturdy. The black vinyl covering has the appearance of leather, and along with the silver accents of the arms and rocker they give the chair a classy, understated look that resists some of the more garish tendencies in gamer-targeted products. Our main problem with the X Rocker II’s design is that it seems proportioned for smaller-framed people, and doesn’t allow for any sort of ergonomic adjustment to compensate. Someone around six feet tall needs to slouch down a fair bit to get the arms at a useable height and the back and headrest into a comfortable position. The gentle slope of the chairback makes this somewhat comfortable, but you may need a small lower back pillow to supplement it. The head cushion is fine for leaning back to watch or play something on television, but for extended sessions with a laptop or tablet, we typically wanted a pillow for our head, which unfortunately would muffle the speakers. In general, we’ve found the chair to be comfortable for playing or watching sessions of several hours, though taller people may need to experiment a bit to find the most comfortable configuration for them. Out of the box, assembling the X Rocker II took no more than thirty minutes with one person. Most of that time went into screwing the arms onto the side with an included Allen wrench. Along with the wrench, all of the necessary screws and washers are neatly packaged in clear plastic backed with cardboard. The chair itself arrives doubled over, so you merely need to unfold it and lock the back in place with a pin that’s already waiting in position. Setting up the audio is also very easy, particularly for anything that uses a 3.5mm audio jack. The ease of connecting something like a television or gaming console is contingent on whether your systems have RCA connections. The chair’s manual suggests that you should be able to connect the wireless adapter via RCA directly to a gaming console’s audio output, which is not possible on most contemporary hardware. We were able to work around this by connecting to the television’s audio output, but not every television is necessarily going to have an RCA output. Our main problem with the X Rocker II’s design is that it seems proportioned for smaller-framed people, and doesn’t allow for any sort of ergonomic adjustment to compensate. You may need to buy a separate analog to digital adapter or audio extractor, depending on the device you’re trying to connect. The chair’s wireless adapter also requires two AAA batteries or a 3V power adapter to operate, neither of which are included. The X Rocker II’s most compelling feature is its built-in surround sound system, which connects either directly or through an included wireless adapter to anything that can output through 3.5mm or RCA audio. Two speakers flank the user’s head right in the top of the chair and a subwoofer in the seat provides for an immersive rumble. Testing with movies, games, music, and podcasts, we found the audio to be crisp and clear, with the adjustable bass offering a nice punch when turned up. We were particularly impressed when testing with games. In Bloodborne, for instance, the spooky, subtler elements of the soundscape whispered in our ears while the growling bass sent every visceral blow vibrating through our bodies. The control and input/output panel on the right side of the seat is simple to use, with a large volume knob that’s easy to locate from its blue light. It’s also easy to grip because of a plastic nub that indicates the current position. One minor annoyance, however, is that the chair must be plugged in at all times in order to use the audio. The included power adapter is about six feet long, which is not the most forgiving or convenient, depending on where you’re trying to use the chair relative to power outlets in the room. Also in an era of HDMI and Bluetooth, the X Rocker II’s reliance on RCA connections, detailed above, feels a bit clunky and behind the times. Priced at $127 at time of this writing, the Ace Bayou X Rocker II delivers solid value, striking a balance between chair construction and speaker quality. It’s easy to spend substantially more on either a comfortable chair or a good set of speakers, so both at this price is an efficient way to spend your money, making the Rocker II great bang for the buck. 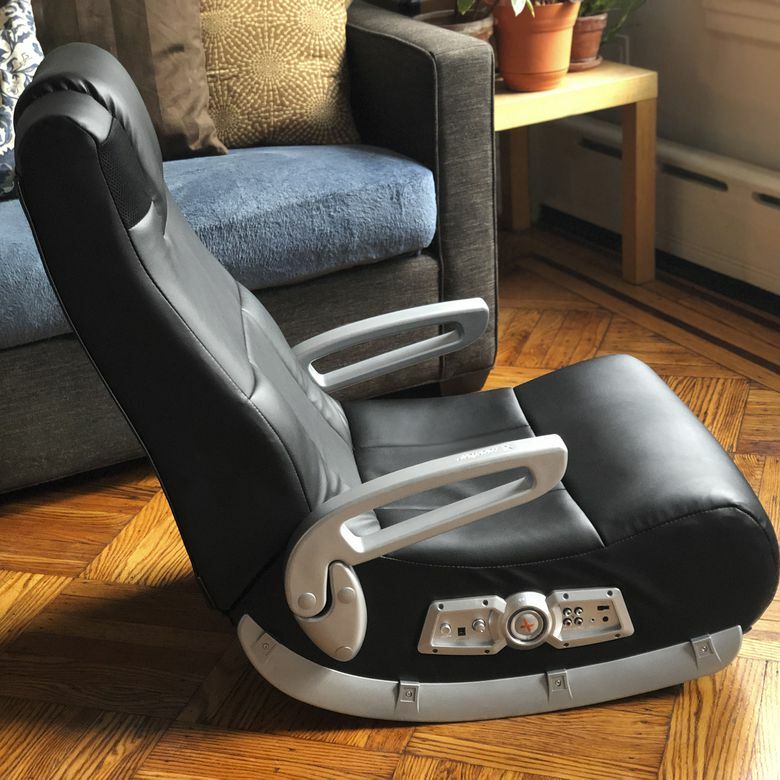 Ace Bayou is one of the few manufacturers of gaming floor chair market with built-in speakers, so the X Rocker II doesn’t have a lot of competitors. Within the X Rocker line, the II offers a good middle ground between the more upscale Pro, which features more speakers and sturdier construction, or the less expensive Extreme or Surge, lack arms and exchange the vinyl cover for cheaper and easier to stain fabric and polyester. Several of the manufacturer’s newer models include Bluetooth compatibility, which may be an important consideration for some. Need some more help finding what you're looking for? Read through our best gaming chairs article. Half a home theater at one low cost. Plush foam padding and a sleek design makes the Ace Bayou X Rocker II an inviting seat for extended play or watch sessions, enhanced by excellent built-in speakers and a booming, in-seat subwoofer. Product Dimensions 27.8 x 18.5 x 17.5 in.